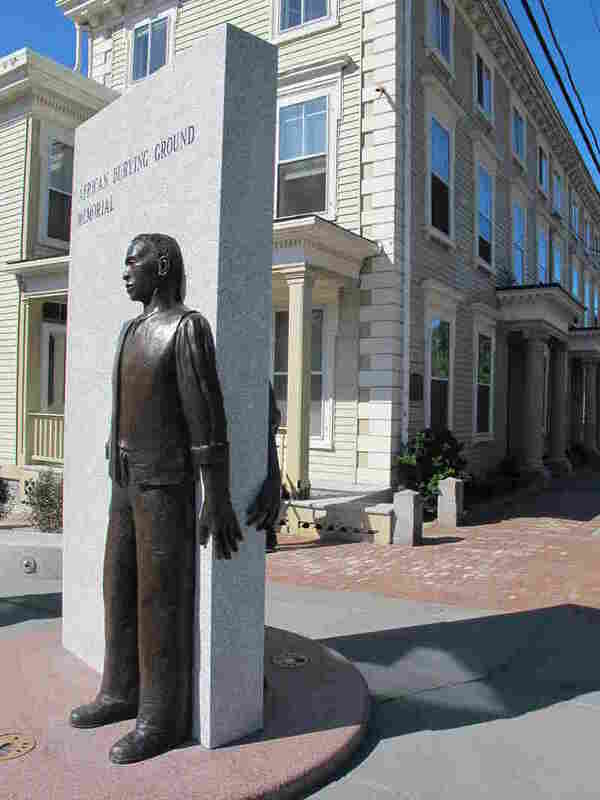 In New England, Recognizing A Little-Known History Of Slavery A burial ground including the remains of 18th century African slaves was uncovered in 2003 in Portsmouth, N.H. Over Memorial Day weekend, the city dedicated the grave site as a special memorial park. The new African Burying Ground Memorial Park was dedicated on Saturday in Portsmouth, N.H.
Two men are sliding nine pine coffins into a vault in the ground on Chestnut Street in downtown Portsmouth, N.H. The remains were disinterred in 2003, part of a long-forgotten burial ground for African slaves discovered during routine road work. Now, they are being reburied among 200 other long forgotten men and women as part of Portsmouth's new African Burying Ground Memorial Park. One coffin contains the remains of a woman who would have been free in West Africa at the turn of the 18th century. But when she stepped off the boat into what is now Prescott Park in Portsmouth, she was likely sold to a white New Hampshire family. At least, that's the best guess of principal archaeologist Kathleen Wheeler. "There's one individual who had only her lower jaw, and she had the incisors removed from the lower jaw, probably as a teenager, and this is a rite they do commonly in West Africa," Wheeler says. The others may have been free or enslaved people. What Wheeler can see from the remains is that they all had African origins, their bodies were worn from toil — and few survived past their twenties. But slavery in New Hampshire? Onlookers like Jack Panopoulos are surprised. "Generally, you tend to think — or I did — that it was more of a Southern problem," he says. Black Burial Site Paved Over in Portsmouth, N.H.
That's a misconception that Georgia-based artist and sculptor Jerome Meadows, who designed the memorial, says he hopes his work will recast. "The setting creates a context in which to reimagine or shift your focus from the misrepresentation into the reality of what actually is here," he says. The $1.5 million memorial park was built with support from federal grants and community donations. Many are proud of the effort. But some, like lifelong resident Dan Mayo, wonder why a relatively prosperous city like Portsmouth didn't fund the memorial with property tax revenue. "They built over all these graves and profited for hundreds of years," he says. "They collected taxes on all these properties that line these streets. And at the very least, they could have footed the bill to pay for this park." Kelvin Edwards is the president of the local African American Cultural Center, which makes him a prominent member of a very small community: Fewer than 2 percent of Portsmouth's 20,000 residents are black. "It hasn't been exactly easy living here as an African-American in such a non-minority community," he says. He says he is proud of the memorial for acknowledging and recognizing the contributions of those buried there: "I think it helps to validate me as an individual, to relate to these souls that have long gone, and that have done so much — and not to be recognized [until now]." Building a memorial on a long-forgotten burial ground won't fix today's social struggles. But it can, Edwards says, help us recognize that we share the past.